Do you want to own the professional clamp meter to test AC/DC voltage & current, capacitance, resistance, frequency, duty cycle, temperature, relative value or diode? You shall try this clamp meter with APP control. 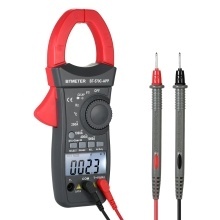 This LCD digital AC/DC clamp multimeter is a portable and professional clamp meter which has almost everything you need for a full multimeter. It&apos;s widely used for troubleshoot electrical problems in industrial and household field, laboratory, shop and home applications. MULTI-PURPOSE CLAMP METER WITH AUTO RANGE: Accurate AC/DC Voltage, AC/DC Current, Resistance, Capacitance, Frequency, Duty Cycle, Temperature, Diode and Relative Value Test. Show "OL" on the LCD If Over Range. WITH CONTINUITY TEST & DATA HOLD FUNCTION: Continuity Test & Relative Value Test. Auto Power off and Data Hold Function. Maximum Display Value: 4000 Counts Auto Range with Overload Protection. EASY TO CONNECT WITH APP BY BT: You Can Remote Monitor the Measurement Condition by Using the Mobile Phone App Which Is More Convenient and Smarter. Easier to Store the Test Data by Mobile Phone. CONVENIENT TO USE AND READ: Portable to Carry and Use. High Resolution, Large & Clear LCD Screen with Backlight for Easy Reading. Widely Used in Your Life. Suitable for Electrical Equipment Testing and Maintenance. WHAT YOU WILL GET: 1 * Digital Clamp Meter, 2 * Test Leads, 1 * Temperature Probe, User Manual(English), 1 * Storage Bag. Max Clamp Jaw Opening Size: 45mm / 1.8in. Work with Low Power Indication. BT APP Connection: Download "CLAMP METER" mobile phone APP. Compatible for IOS or Android Smartphone (The App can be installed for IOS 7 or android 4.30 system and up. Support BT 4.0 version).